*To pay by check and save credit card charges, please send an email to karma@tibetchild.org or call (406) 461-8745. 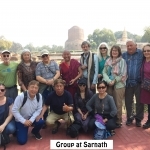 On this very special tour we will trace the footsteps of the Buddha from his birthplace at Lumbini, his Enlightenment at Bodh Gaya, his very first sermon at Sarnath to his parinirvana or passing away at Kushinagar. 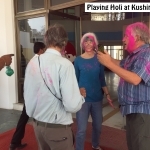 First time travelers to India often find it an overwhelming experience. Often, things in India are overwhelmingly different, contradictory and evoke strong responses. Underneath that external chaos is a land of majestic beauty and architectural splendor saturated with spirituality. On this tour, we will seek inspiration and learning from one of the most influential teachers the world has ever had – The Buddha. At every sacred site, we will take time for introspection, reflection and learning. Regardless of whether one is a Buddhist or not, there are spiritual values and inspirations that we can take away from every site – the sum total of which can be a journey of spiritual awakening and self discovery. Our very best hope is that this will be an experience of a life time – something that truly changes your outlook and restores a sense of balance and harmony in your life. 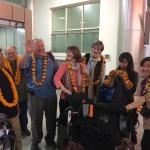 Feb 18: Arrival in N.Delhi to discover the inner peace of a city rich with culture, architecture and human diversity, deep with history and totally mesmerizing. The capital of India, Delhi has a historic past and a vibrant present, blending the beauty of the Mughal Empire found in the ancient walled city to ultra modern skyscrapers and official government buildings. 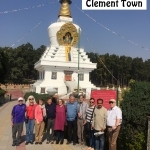 From Delhi, we will head to Clement Town, in the district of Dehra Dun. Located about 200 miles north, Clement Town is a thriving Tibetan community in exile. Here we have family and life long friends and we will be immersed completely in the Tibeetan culture. The settlement is blessed with stupas, monasteries and other Buddhist monuments. The local Tibetan families are our friends and we may even have a meal in someone’s house. Clement Town is also the home of Kyitsel-ling Tibetan Children’s Education Center – the education hostel that TCEF helped to found. The group will be very special and honored guests here. Group members who are also TCEF sponsors can connect with their sponsored child or elder. Last year, we made several emotional and heart warming connecions. 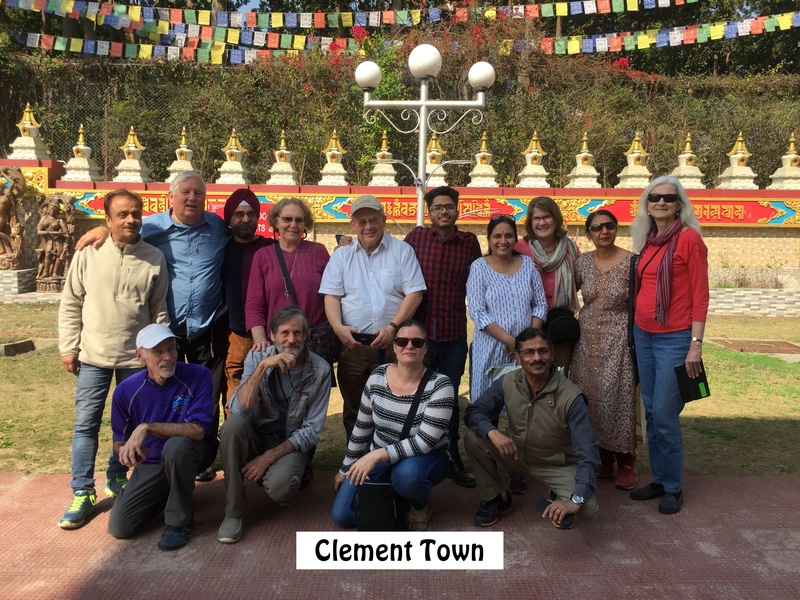 Throughout our day with the Tibetan community at Clement Town, we will reconnect with old friends and say hello to the children and elders on our sponsorship programs. 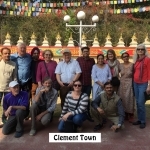 At Clement Town, it will all be about connecting the Tibetans with the TCEF board, sponsors and supporters. On Feb 21: We may take a day trip to the holy city of Rishikesh – situated on the banks of the Ganges river at the foothill of the Himalayas. The Ganges here is strong, clean and fast. People believe that bathing here removes layers of negative karma, purifies the soul and opens the way for ultimate freedom. 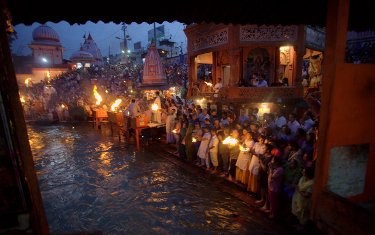 An evening Aarti – or worship with devotional songs on the Ganges can be a really peaceful and moving experience. 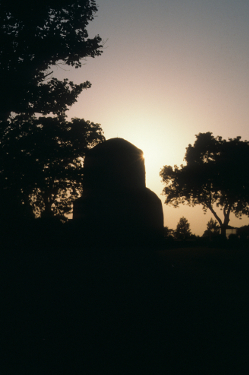 After he received Enlightenment, the Buddha spent the next 45 years teaching and it all began here at Sarnath. Here at the historical Deer Park, he taught his very first sermon and set in motion the ‘Wheel of the Dharma’. At the site where the Buddha first spoke the words of the Dharma stands a massive stupa called the Dhamekh stupa. The original stupa was constructed by Ashoka. 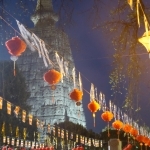 Pilgrims visit this place to circumambulate this sacred stupa and to worship the Buddha. The first discourse of the Buddha was on the ‘Wheel of Law’. The wheel symbolizes samsara – the eternal round of existence which goes on and on, life after life because of ceaseless cravings and desire. 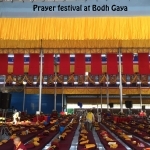 Right in the shadow of the massive and ancient Dhamekh stupa, one can get a sense of the profound message that changed billions of lives, one can reflect on our own ceaseless cravings that bring so much suffering – and take our first steps in letting go – whether it is external ‘stuff’, a bloated ego or emotional negativities. 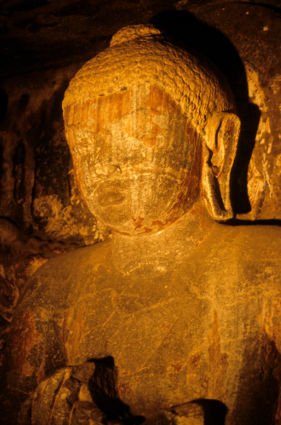 If there is one central and eternal message from the Buddha to take from this sacred site,it is that our cravings and attachments often can be the cause of suffering…. A life of balance, a freeing away of attachments even if it is only material attachment that you can free yourself of, is a great beginning to start a life of balance. 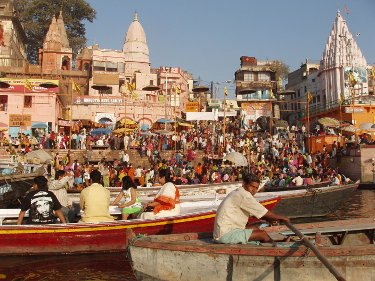 Varanasi is an ancient and holy city in the northern Indian state of Uttar Pradesh dating to the 11th century B.C. 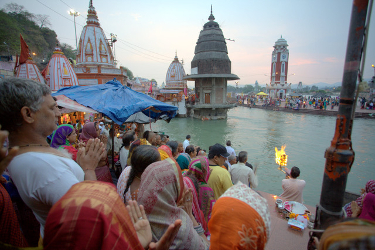 Regarded as the spiritual capital of India, the city draws Hindu pilgrims who bathe in the Ganges River’s sacred waters and perform funeral rites. Along the city’s winding streets are some 2,000 temples, including Kashi Vishwanath, the “Golden Temple,” dedicated to the Hindu god Shiva. 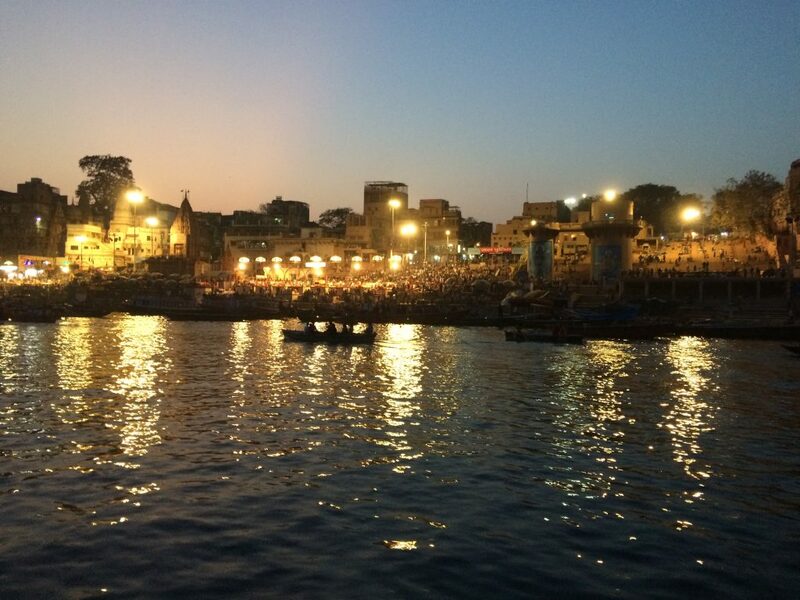 Life on the banks of the Ganges here at Varanasi begins at dawn when thousands of pilgrims come down to the river to wait for the rising sun when the sacred river will cleanse them of their sufferings and wash away their sins. 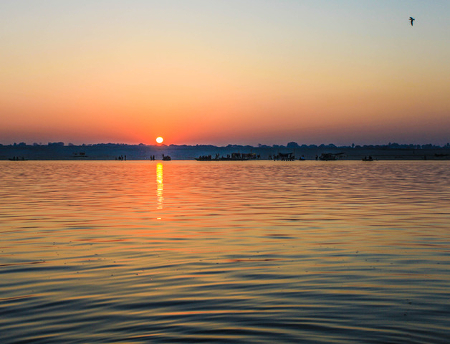 Varanasi is situated on the western bank and has a spectacular view of the rising sun. It is one of the most fascinating cities in India. 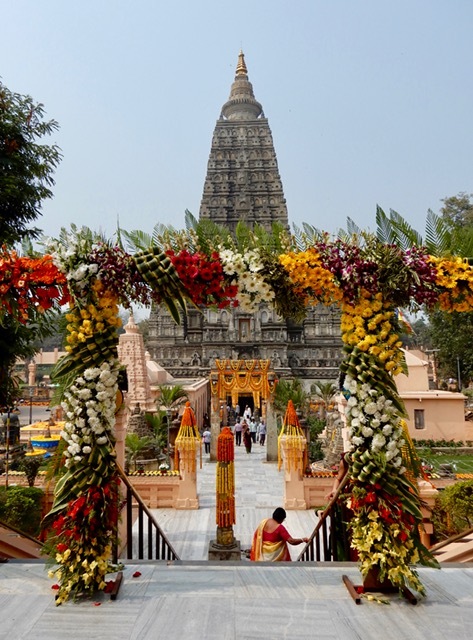 Located in the Indian state of Bihar, Bodh Gaya is the most sacred place for all Buddhists – the Mecca of Buddhism. 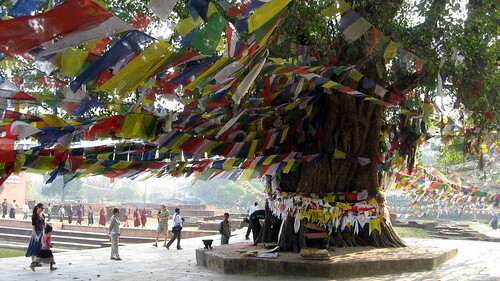 This is the place where the Gautam Buddha attained Enlightenment or Nirvana under the Bodhi tree. 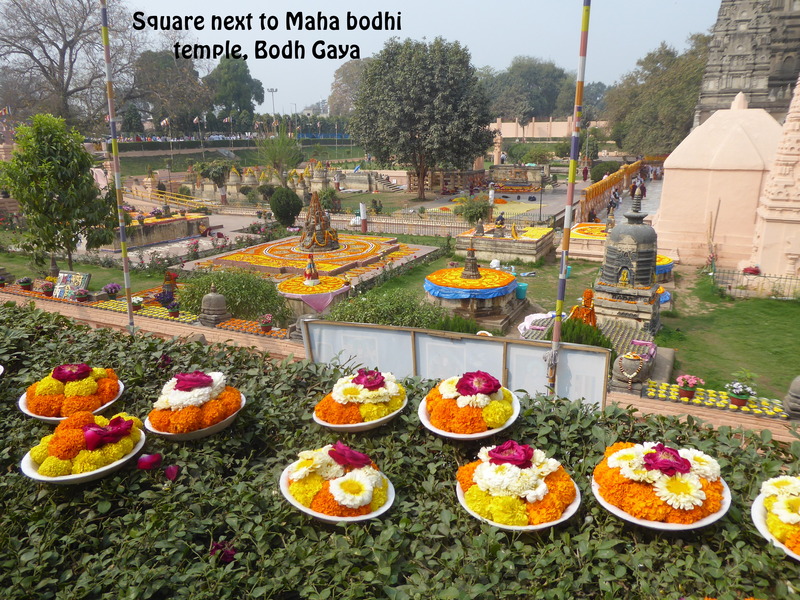 Bodh Gaya today is dotted with Buddhist temples from all over the world – but the heart and soul of Bodh Gaya is the Mahabodhi temple – a UNESCO world heritage site. 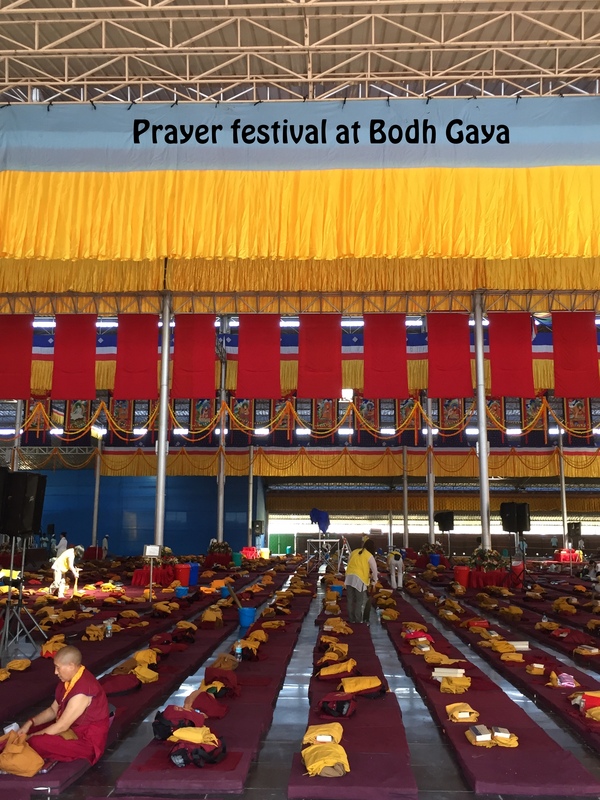 In the inner compound of this holy temple is a bodhi tree – a direct descendant of the tree under which the Buddha became enlightened 2500 years ago. Here, we will breathe the air of spirituality , sit and meditate under the same sacred tree. For some, this sacred experience might sow the seed of a spiritual awakening, for others it might simply be an opportunity to think about how they can bring some balance and compassion in their own lives. Rajgir is the place where the Buddha taught the Transcendent Perfection of Wisdom (Prajna paramita), at the Vulture Peak, sixteen years after his enlightenment, to an assembly of 5,000 monks, nuns and laity, as well as innumerable bodhisattvas. This teaching is known as the second turning of the Wheel of Dharma and it focus on understanding the meaning of ‟emptiness”, which is the ultimate nature of phenomena. When Buddhism states that emptiness is the ultimate nature of things, it means that the things we see around us, the phenomena of our world lack any autonomous or permanent existence. But emptiness is not at all a void, or the absence of phenomena, as early western commentators of Buddhism once thought. According to Buddhism, learning to understand the essential unreality of things is an integral part of the spiritual way. Knowledge of our spirits and knowledge of the world are mutually enlightening and empowering. The ultimate aim of both is to dissipate suffering. Kushinagar is the place where Lord Buddha passed away near the Hiranyavati River and was cremated at at the Ramabhar stupa. It was once a celebrated center of the Malla kingdom. Many of its stupas and viharas date back to 230 BC-AD 413. when its prosperity was at the peak. In 543 BC, on a full moon night of Magh the legend delivered lecture to his Sangha and declared that he is going to leave the mortal world soon enough. Kushinagar also expresses the common thread of all sects of Buddhism through its magnificent Viharas, Chaityas, temples and Tibetan monasteries. 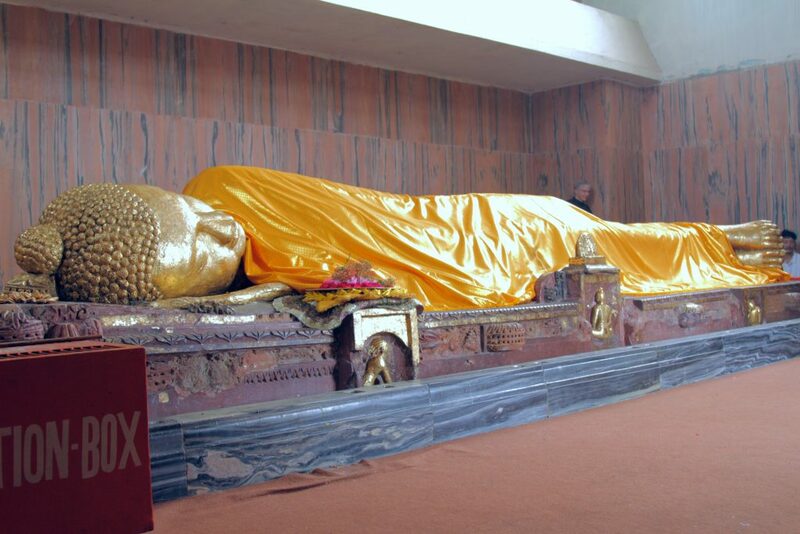 Kushinagar’s greatest lesson is that of the impermanence of all phenomena – including the mortal form of the Shakyamuni or Buddha. An inner realization of this phenomena may not rid our trials and tribulations – but it will help one to overcome them without too much stress and fear. Mindfulness of impermanence helps all to lead a balanced life where fear does not rule. One of the four most holy places for Buddhists, Lumbini is situated at the foothills of Himalayas in the Terai plains of southern Nepal. The bewitching beauty and tranquility of Lumbini is not only for the pilgrims but also to any one seeking peace and serenity. 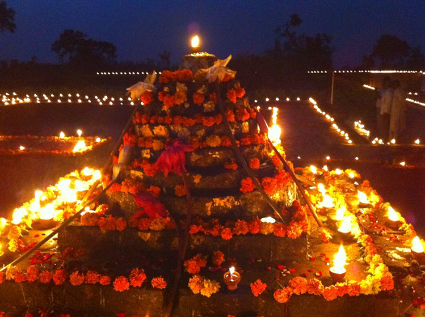 This spiritual destination is filled with historical, cultural and spiritual values. Lumbini associated with the birth of Lord Buddha is of immense archaeological and religious importance and also a UNESCO Cultural Heritage Site. It is said that Prince Siddhartha Gautam, who later became Buddha the ‘Enlightened One’, was born in the gardens of Nepal’s Lumbini in 623 B.C. 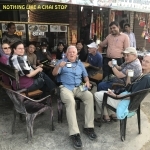 The five day Kathmandu add on will combine meeting and socializing with old friends in Nepal, shopping, some down time and more visits to the fabulous stupas and monasteries in the Kathmandu Valley. Expect new and often unplanned social and cultural experiences as we connect with old friends for dinner. There is really a whole lot to pack in the 5 days in Kathmandu. While the tour will provide some planned activities, people are free to search/explore whatever they might want to do. 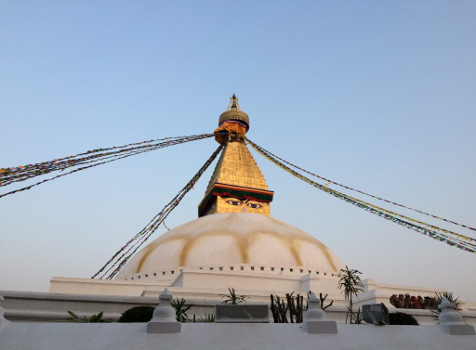 Day 2 March 5: After breakfast at Thamel, take taxis to Boudha and visit the famous Boudha stupa. People can shop around the Boudha area and spend the day as they see fit. Dinner at restaurant at Boudha. Return to hotel by taxis. Day 3. March 6: FREE DAY to shop, explore, have a downtime OR Visit Pashupatinath temple and Bhaktapur. Day 4, March 7: Breakfast at Hotel, taxis to the Swambhunath or the Monkey Stupa as it is called in some guide books. Hang prayer flags. Both academically and personally, I have explored Buddhism for most of my adult life. As a United Methodist pastor and college history teacher, I always found ways to integrate the wisdom of Buddhist teachers such as the Dalai Lama, DT Suzuki, and Thich Nhat Hanh into my sermons and classroom lectures. My own personal spiritual life has always relied heavily on Buddhist informed practices of meditation and prayer. In my frequent trips to India beginning in the 1970’s, I paid particular attention to the returning Buddhist influence in India, particularly the Tibetan Buddhist movement beginning in 1959 with the exile of the Dalai Lama. Through it all, however, I remained firmly planted in my United Methodist tradition and Christian practice. 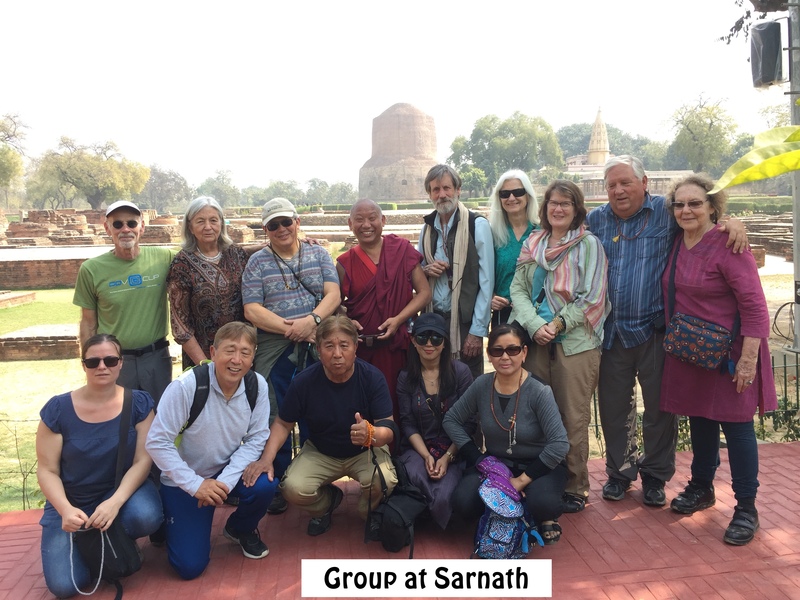 It was not until this first year of my retirement from active church ministry, that I decided to undertake a pilgrimage to the historic Buddhist sites in North India and Nepal. Many of these ancient sites have been and are being renovated by international teams of archaeologists, historians and Buddhist communities. 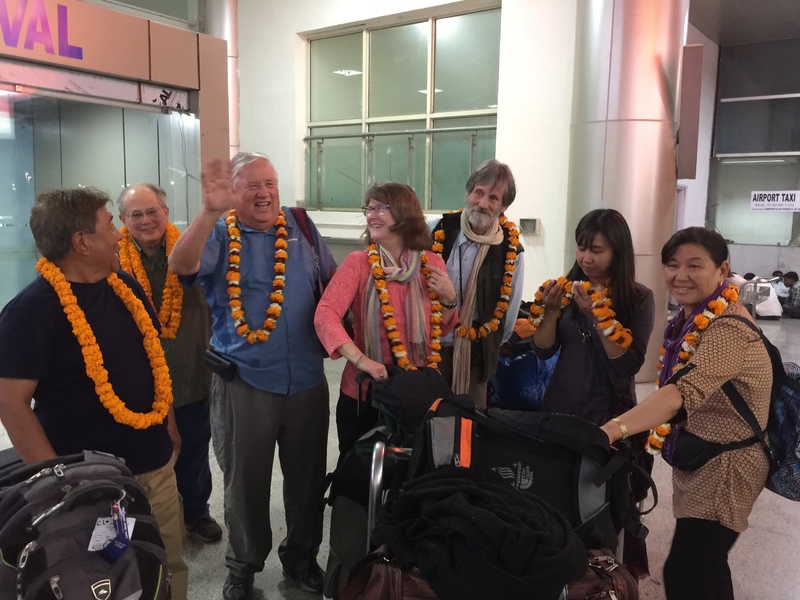 I journeyed with other pilgrims, mostly from Montana to North India. 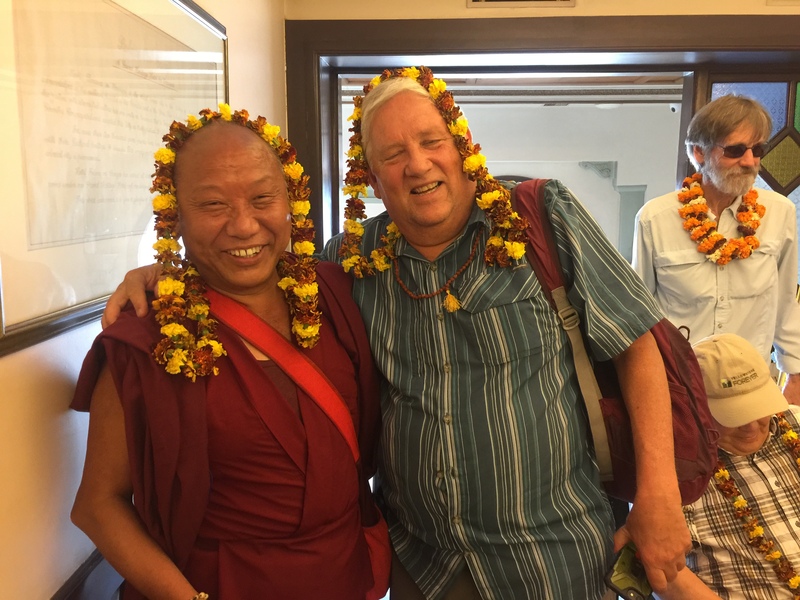 The trip was designed by India Supera, President of the Feathered Pipe Foundation and led by Karma Tensum, Executive Director of the Tibetan Children’s Education Foundation. Karma and his family provided an extraordinary experience that was both intellectually stimulating and spiritually enriching. As a Christian pastor, it was a delight to witness Buddhists simply being Buddhist! 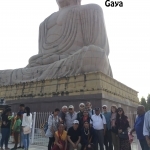 People from every region on earth make pilgrimage to these sites, so I met Buddhist pilgrims from Thailand, Myanmar, Cambodia, Japan, China, Viet Nam, Laos, Singapore and Nepal. I also met pilgrims from America, Canada, South America, Africa, Russia and Western Europe. The sites themselves are being responsibly excavated, preserved, and restored under the watchful and protective eye of the Indian government. New stupas, temples and facilities for tourists and pilgrims are being tastefully constructed along with new highways, modern rest stops and shopping facilities to ease the pilgrim’s way. Karma Tensum and his family lead by example. 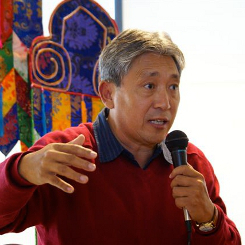 Karma, among other things, is a Harvard educated teacher, administrator and advocate for Tibetan people. On this pilgrimage, he and his family quietly practiced their mantras and devotions without “preaching” or heavy-handed discourse. Yet they were always available for questions. Their answers were always well-informed, patient and kind. 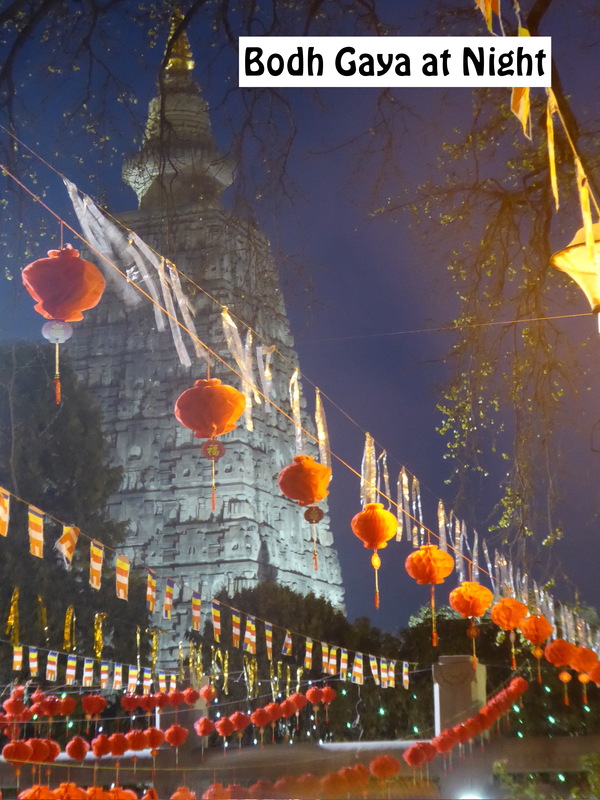 In addition to his own knowledge of Buddhist culture, Karma also provided a well-trained guides at each pilgrimage site to help us understand what we were seeing. I was never uncomfortable as a Christian within this atmosphere of Buddhist practice. I used my Tibetan prayer beads as instructed but always felt free to add my own prayers, chants and thoughts. Karma was gentle and firm in reminding us that we are on a pilgrimage and not just a tourist adventure. We spent lots of time circumambulating the various holy sights saying our mantras and counting with our prayer beads. Chants, mantras, prayers and discourses could be heard in a dozen different languages at each stop. The peacefulness of the settings was powerful even with the presence of so many pilgrims. In other moments I found myself in conversation with Buddhist practitioners who, like me, were astonished and moved by being at the holy sites of the Buddha’s birth, teachings and ministry. More importantly, there were moments of laughter, sharing and gentleness. 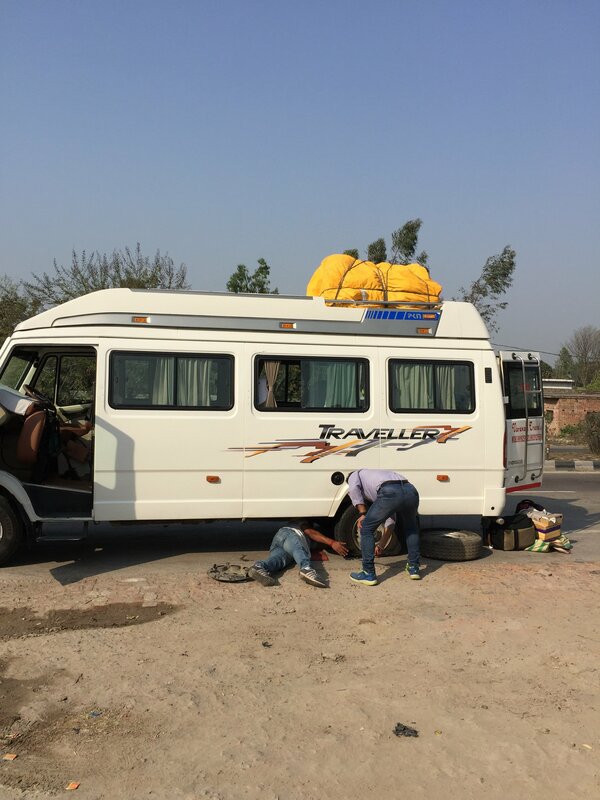 Our tour professionals from Multivision Tours, Raj Madaan and son, provided excellent accommodations, safe transportation, incredible food and frequent opportunities for rest and relaxation. It was in many ways a life-changing experience. Buddhism is roughly 600 years older than Christianity and I can easily imagine Jesus deeply appreciating the teachings of compassion and peace that form the foundation of Buddhist thought and practice. If you have the opportunity to “follow the footsteps of the Buddha” with Karma Tensum and family, I urge you to do so. You will be blessed. 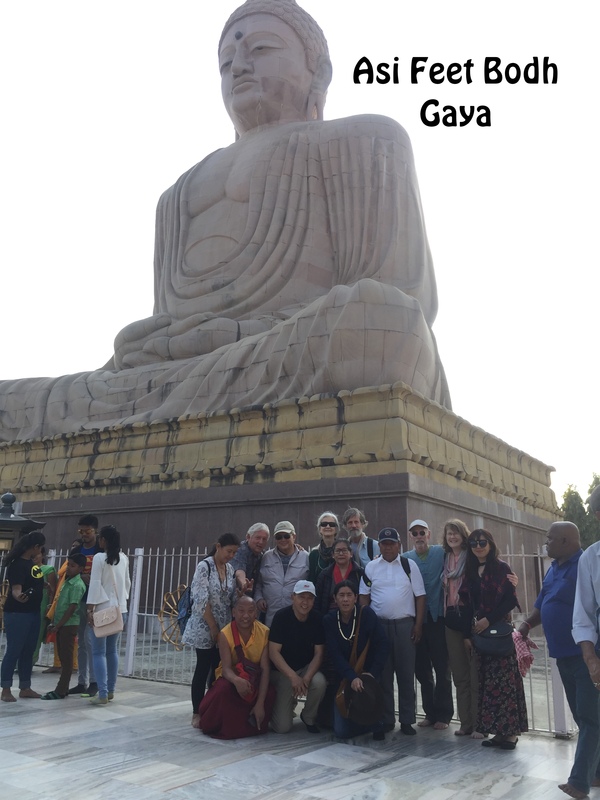 I can’t say enough good things about the Footsteps of the Buddha Tour 2018. 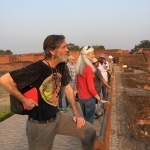 I have done several other pilgrimages in India over the years, and this tour was up there with the very best I’ve been privileged to get in on. I was unfortunately only able to do the Sarnath/Varanasi/Bodhgaya part of the trip, but loved it all.. 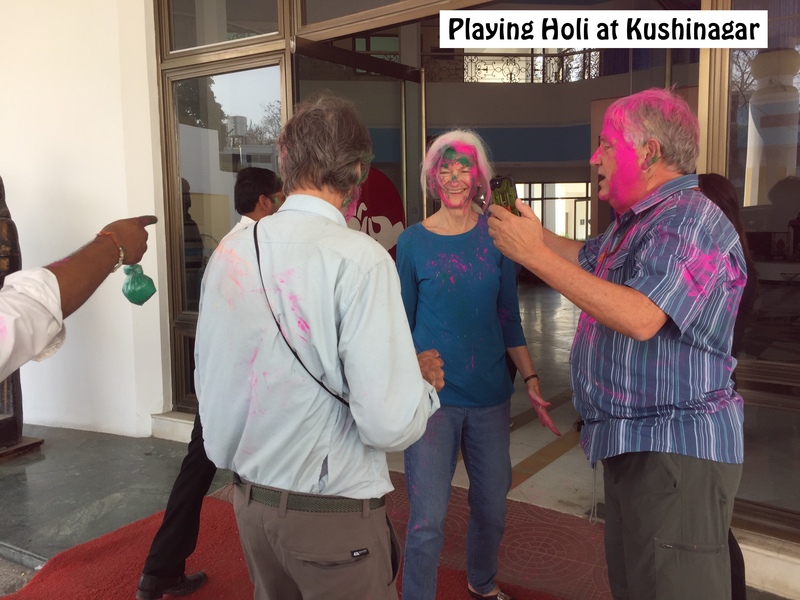 The planning by India and Karma was impeccable, and Winter and Raj did a superb job of organizing and executing all of the details of this trip. 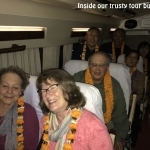 Every day was a new and exciting adventure, and we could not have had a more fun and easygoing group of friends to travel with–so much fun and laughter! What Karma said about pilgrims “being bonded for life” is true! Lama Paljor as our “spiritual director” was a great addition to our group of pilgrims, and hopefully he’ll be able to join us again on future tours. I also appreciated having such beautiful and comfy hotels to come home to after our very full days visiting various holy sites. . Both the Palace on the Ganges and The Royal Residence in Bodhgaya were some of the nicest hotels I’ve ever stayed in. 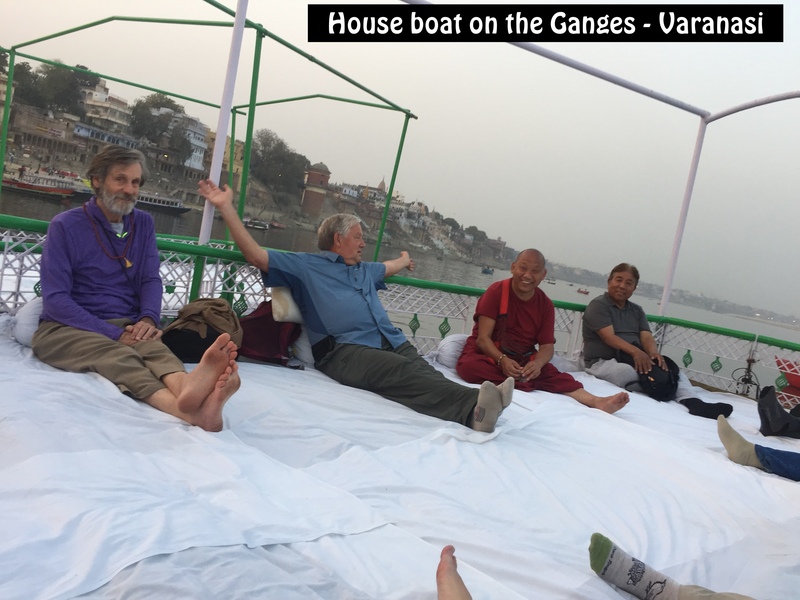 I know there was some talk about not including Varanasi on the next trip, but those morning and evening boat rides and pujas on the Ganges were some of the highlights of this trip for me–the evening concert on our boat with Saket Maharaj and his musician friends was especially memorable. I think the Footsteps concept is a compelling reason to join up for this tour, especially when you realize you’re actually experiencing tangible historical sites that are evidence of the existence of this man, who has affected the lives of billions ever since. 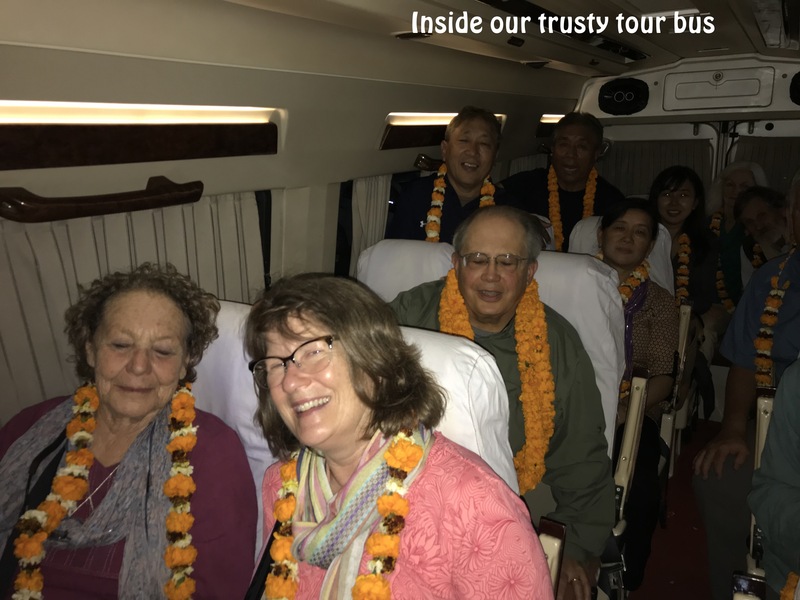 It made real, what happened at these places: the Buddha’s birth, his death, first and last teaching, where he became enlightened… The tour also provides the opportunity to experience the remarkable country that is India. Doing the four major pilgrimage sites of Sarnath, Bodh Gaya, Kushinagar and Lumbini is the hope and dream of every Buddhist. To undertake this pilgrimage in the company of the TCEF group and in the comfort that the tour provided was an amazing experience. I’ve visited some of the sites before and had no idea that such great properties existed on this travel route. Each and every site was special. As a pilgrim, I was delighted that the tour gave everyone the time and personal space to make every site memorable. That way, I was able to soak in the blessings of these special places. 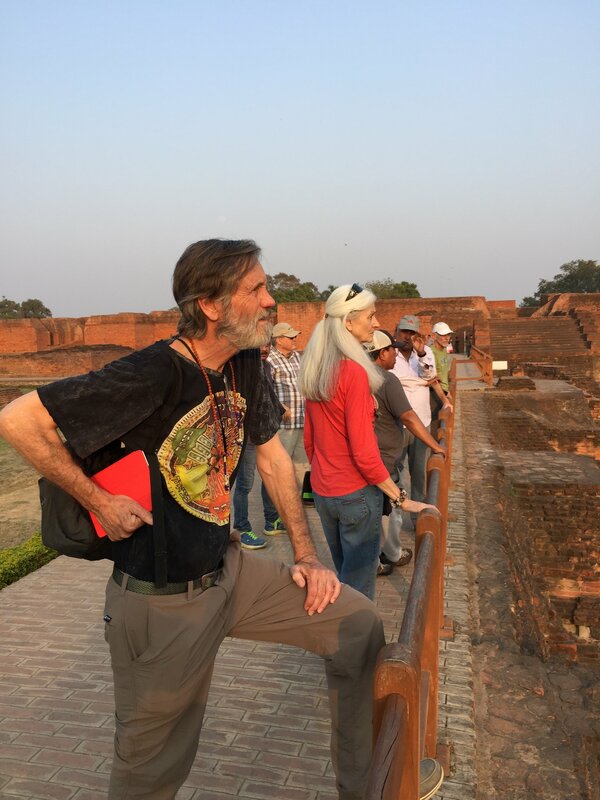 I have been going to India for over 50 yrs and have made so many trip- I can’t even count them .. but the footsteps of the Buddha tour took me to places that I had never been . we were in remote places of Bihar – it felt like old India from 50 years ago. We had a long bus ride but it was so interesting that we got hypnotized by the beauty and the magic of it all. We saw sites that many people will never see and we stayed nights in fabulous hotels – absolutely fabulous .. we had great food, two meals a day. It was so fun to travel with Karma and his family. There’s nothing like a pack of Tibetans to make you feel peaceful and happy. I can’t say enough good things about this memorable tour. 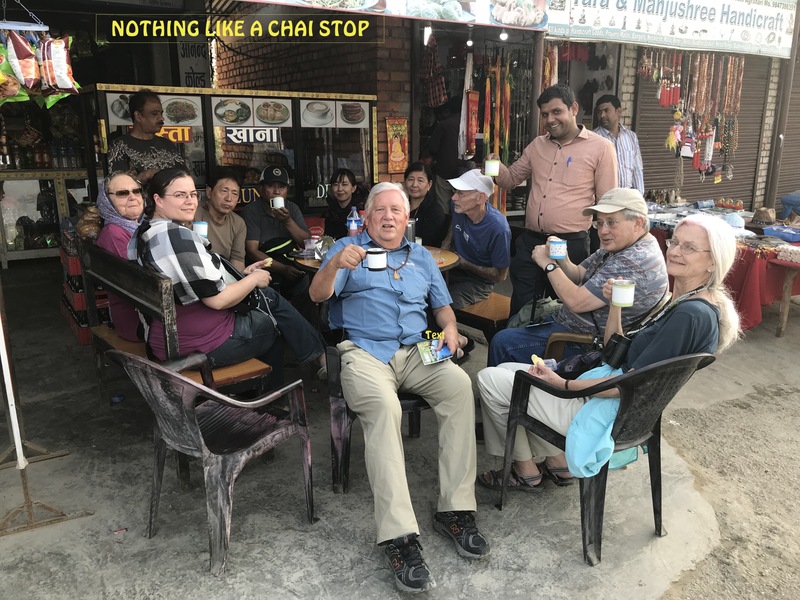 Our whole group took the add on to Nepal which was another amazing experience – there are many old and powerful sites in Kathmandu . We have some of our best and long time Tibetan friends in Nepal and they made us feel so at home -as they will do you too when you come. TCEF knows better then anyone how to do India and Nepal. Don’t miss a chance of a lifetime ! Sign up for this tour! 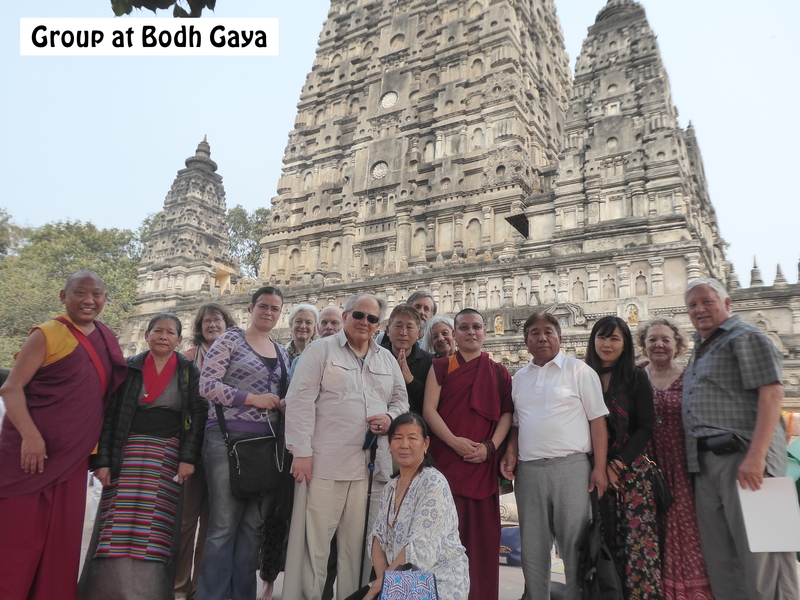 The Footsteps of the Buddha tour was eye-opening and heart opening in ways I had not imagined. 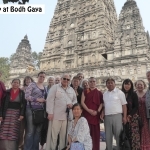 Though I am not Buddhist, I have certainly benefited from Buddhist teachings and had always wanted to visit Bodhgaya, and the Bodhi tree where the Buddha awakened. This was just one of the major Buddhist pilgrimage sites we visited. Not only did we get an introduction to India, and some of its great holy places, we learned a great deal about Buddhism, and the vast richness of this wisdom tradition. For first timers in India, traveling with an experienced guide makes it all so much easier. Karma Tensum, Indian guide Raj, and a phenomenal bus driver did a great job of shepherding us through all the challenges of foreign travel, and helped make the experience comfortable, safe and fun. 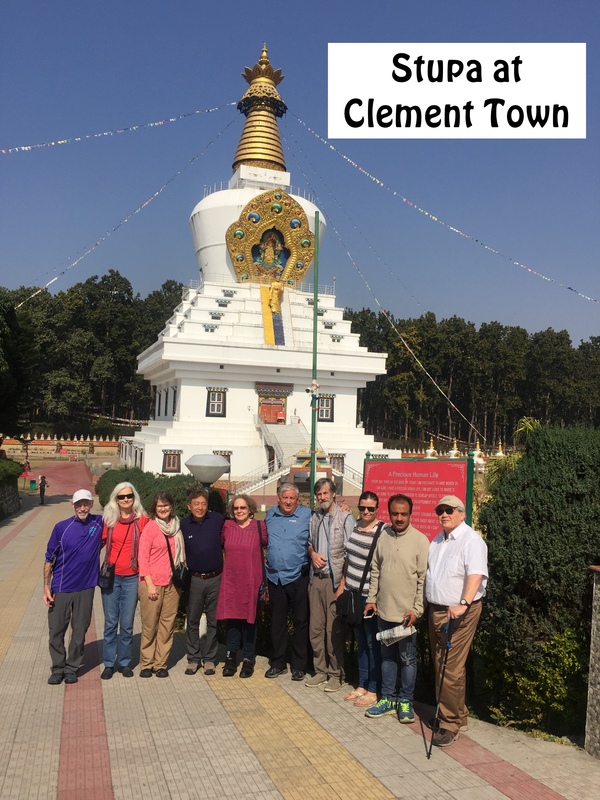 The visit to Clement Town and Kyitseling was a highlight of our trip. This Tibetan refugee community has a peace and aesthetic that was enchanting. 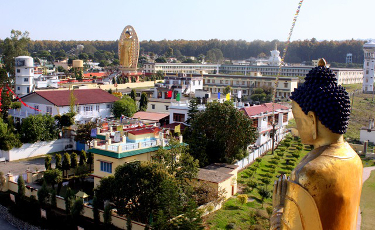 The beautiful stupa, monastery and adjacent nature preserve all add to the quiet charm of this town. 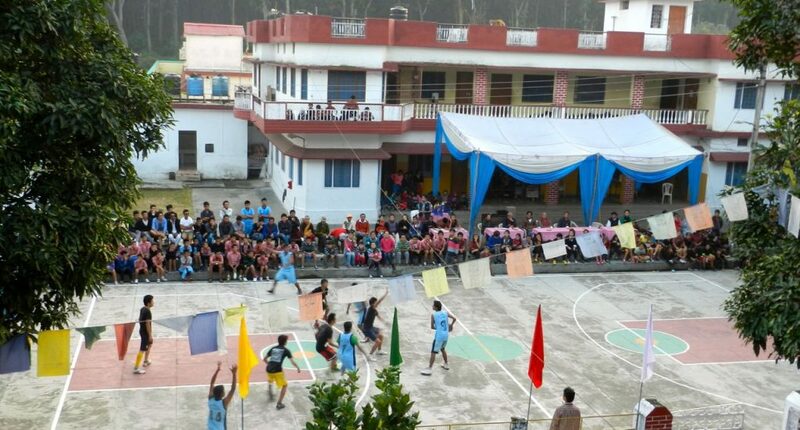 And getting to see Kyitseling and meet many of the students was a sweet part of the trip. One definitely comes away with a sense of Tibetan culture, the great education these children are getting, and the gifts the Tibetan diaspora is spreading around the world. India Supera, Executive Director and founder of Feathered Pipe Foundation, as many friends of the Feathered Pipe Ranch know, has long loved the great civilization of India. She spent her 20’s studying with her guru Sai Baba and living and traveling extensively in India. Inspired by the culture, beauty and spirit of the country, she has brought the Sacred Spirit of India to the Ranch. India herself has been a passionate and vibrant leader inspiring many in their personal spiritual journeys. 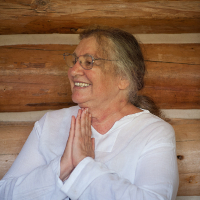 As the founder of the Feathered Pipe Ranch, she has, for the past 35 years, led many retreats and tours around the world. For the ultimate spiritual tour of pilgrimage destinations there can be no journey more inspiring than a tour in India of the holy cities. India will introduce you to the India she loves with great Compassion and Joy. Her knowledge of the culture and history will enrich this tour of the majestic beauty, architectural splendor, and natural wonder in the land saturated with spirituality and divine love – Mother India. Karma was born in Tibet but raised in Northern India. 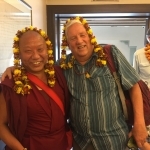 Born into a Tibetan refugee family his life was transformed by an education made possible by the wisdom of HH The Dalai Lama and the early Tibetan leadership in exile coupled with the compassion of kind sponsors. 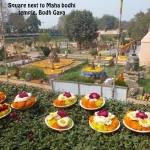 Karma’s life experiences is custom built to lead this Foot steps of the Buddha tour in the heartland of India. Raised as a cultural Tibetan, he is a practicing Buddhist. Educated in India he has a Master’s in Indian History and Culture. Having lived in the West for the past 15 years he can share Buddhist philosophy or Indian history in a way that can relate to Westerners. An $800 NON-REFUNDABLE deposit is required to hold your space. Final payment is due December 31, 2018. Rooming: If you want a double room we will try to match you with a roommate. It sometimes happens that we are not able to do that – in that case you will have to purchase a single supplement. You must have your passport and visa before you leave the US. India has now outsourced its visa issuing to Cox & King Global Services (516-206-1483 / 646-589-0088). Expect the entire process to require 2 – 4 weeks. Your passport is ok if it does not expire before April 30th. Foreign nationals are only allowed to apply for 10 year tourist visa. (They will automatically issue you a multi-entry one, so those going on to Nepal needn’t worry about the return to Delhi.) We will get our Nepal visas at the border for the extension. RAJ MADAANMULTIVISION TOURS & TRAVELS (P) LTD.
It’s a good idea, prior to departure, to send yourself an email with your passport numbers and any other important numbers – like credit cards, traveler’s checks, etc., so you can retrieve them easily if you need them. Also, scan the inside front page of your passport, and the page with the visa stamp, and email it to yourself. SEND us a good quality photocopy of the inside front page of your passport and the visa page, or a good, legible scanned copy. Having this will speed up replacement should that ever become necessary. We are in the process of investigating the best airfare for both the international travel and in-India air-travel. Upon securing best rates, we will contact those who have registered to book air flights accordingly. You must have travel insurance! If you think you can’t afford it, just think of the financial consequences if you don’t have any and something goes wrong. Make sure your insurance covers health care, theft of property, lost luggage, travel delays. Over my many years of travel in India and surrounding area I have used every one of those coverages at one time or another. We are traveling in safe places, not doing dangerous things, but you will want to know that if anything were to happen, you would be covered. Then you can travel with your mind at ease, and so can we. We recommend Travel Guard Insurance www.travelguard.com which can be purchased on-line. Continue with whatever daily vitamins you are currently taking, with the addition of a good probiotic (Renew Life or Nature’s Way Optimum are good ones). Begin taking “CoQ10” – an enzyme that helps oxygenate your heart and head. Begin taking extra Vitamin C. Taking Acidophilus regularly – starting a month before you leave – will keep your intestines happy. If needed, booster doses for tetanus, diphtheria and measles, and/or a one-time dose of polio for adults. We recommend that you fit all your personal items into one pull-along suitcase that you can handle easily yourself. We will have porters everywhere, but you should be able to handle it yourself just in case. Inside that suitcase bring a light duffle bag for things you purchase along the way. The in-country flights have a 35 lb weight limit. Use security-style luggage locks — the kind that the security people can unlock with their special keys. This way your bags may remain locked in transit. We are happy to help you decide what to bring. PLEASE HAVE YOUR LUGGAGE VERY CLEARLY MARKED AND EASY TO IDENTIFY. Prior to boarding your domestic flights in India, as you leave the main terminal you sometimes may be required to identify your checked baggage as it’s being loaded. Failure may mean that your checked baggage will not be put on the flight. Unfortunately, this process is not followed by all airlines and at all departure points, SO PLEASE MARK YOUR LUGGAGE WELL. Comfortable and modest clothing is the key. Bring flip-flops and whatever comfortable walking shoes you like. Sometimes when you take shoes off outside temples they disappear so don’t bring your most expensive shoes. There are some Hindu temples that forbid you to take any leather goods – such as belts, wallets and leather bags – inside the temple. Therefore keep leather to a minimum. Both men and women will need to cover their heads prior to entering a Sikh place of worship. You MUST bring a money belt that goes underneath your clothes for your passport, etc. Bring long pants, good walking shoes and changes of cotton socks. Dress modestly. We can easily get ready-made Punjabis and saris at any level of quality and price in India. 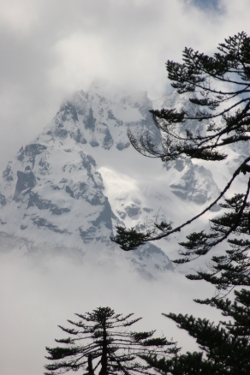 If you are coming to Nepal we will have another list for you. Flashlight, batteries, day pack, water bottle, dental floss, tampax, watch, sunglasses, sun hat, insect repellent, something for the itches in case you don’t get the repellent on fast enough, any medications you need (prescription or otherwise). Electricity is 230-240V, 50 cycles, alternating current. (You will need transformers for electrical equipment.) Light rain gear will be good to have. In other words, bring anything you may need for your health and safety – bring it rather than relying on finding it in a culture vastly different from our own. There are internet cafes almost everywhere and our hotels will have internet. Bring only those yoga props you absolutely need. The currency is the Rupee. It is pretty easy to obtain in any hotel (in Delhi) or from readily available, but not always functional, ATM machines, etc. So, for the smaller towns, do bring some traveler’s checks, dollars in addition to debit/credit cards – it is easy to convert them into Rupees. Talk with your bank and credit card companies before you leave home and pre-arrange the amount you can draw or spend at any one time, so you don’t get stymied by an unexpected limit. (India is an absolute delight as far as what you can buy there – gems, carpets, saris, artworks, etc., costing up into the thousands. There’s no end of money you can spend in India – just decide what you might want to spend before you leave.) Everyone will charge you a fee to use credit cards. When you arrive at the airport in Delhi, there are good ATM machines there. SO BE SURE TO GET YOURSELF $200 WORTH OF RUPEES BEFORE YOU LEAVE THE AIRPORT. That will handle your immediate needs without having to hassle with finding an operating ATM somewhere else. We will be eating mostly in hotels or at friend’s houses but everywhere we must take basic precautions. This will all be explained as we go along but the basic rules are: No salads, even in hotel buffets, peel any fruits or vegetables yourself; eat only hot foods, no ice. Bottled water only – inspect the seal, don’t drink from any bottle with a broken seal. Learn to love Indian food. India has the best food in the world. It’s a well-developed vegetarian diet. If you are attached to having some particular food, bring it along. It is part of the religious tradition in the North to incorporate things like hashish. Bhang lassi is a drink made from the leaves of marijuana with yoghurt. There is not a big judgment around this and you will encounter it. If you decide to experiment be wide awake and in a safe place. Intoxication makes you susceptible to robbery. My advice is the same as in the US: best left alone unless you’re in the proper circumstance for it. I will collect the money for tips ahead of time. This way we can make sure to handle all of the gratuities and alms in the way that will best help the people in the communities you will be meeting, and you won’t have to worry about it at all. 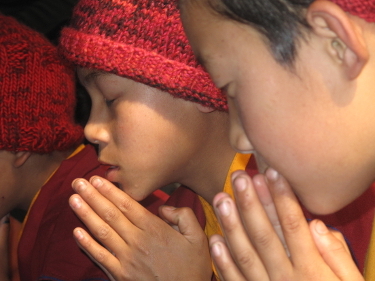 Visit the TCEF website (www.tibetanchildrenseducation.org) – our main charity in India. We also will handle all of the normal tipping for dining rooms and luggage, etc. Most people don’t know where to pay baksheesh, what bribes are needed, etc., and we do. I find it easiest to collect the money before we leave. It will be $200 per person for India. If you do see something you feel you’d like to give to, ask for my help to avoid scams. If you read only one book I recommend Freedom at Midnight, by Larry Collins and Dominique Lapierre. It’s based on the events leading up to independence from England and will give you a good political background for modern India. Spiritual readings: We’re going to be mostly in Tibetan Buddhist world, so you may want to read up on it. You may also want to read up on Hinduism in the Mahabharata, or any condensed version or the Ramayana.